Crispy and moist. Simple and flavorful. Long soak, slow grill. 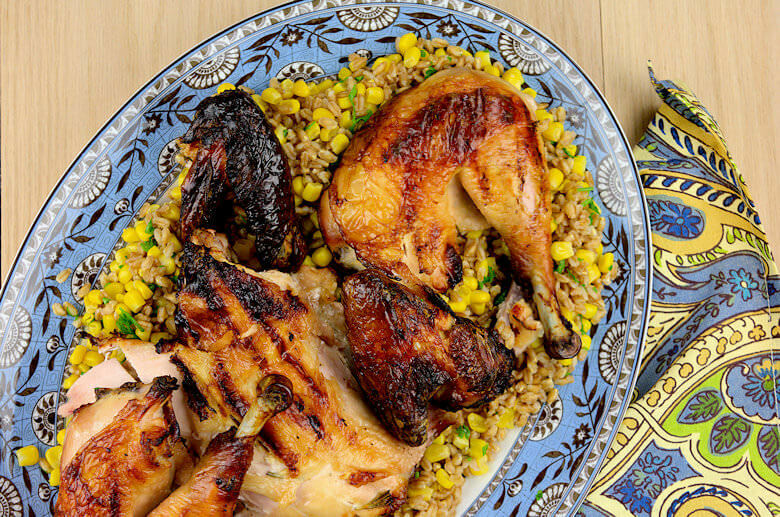 This Grilled Butterflied Chicken with Rosemary is a very satisfying dish. I combined it with a Farro Corn Mix, but any combination with potatoes, rice, pasta, or any other carbohydrate source in combination with a fresh salad or a warm vegetable will do. Chicken is in general a very easy meat to work with, but at the same time, I have eaten some pretty dry chickens in my life. There is a way to dry these ladies that it become a chore to eat them. One way to keep the meat moist is to brine it. There are many different brines; I favor a wet brine over a dry brine and for this butterflied chicken I used a buttermilk to brine. This buttermilk brine is very basic, but does the trick. Why buttermilk, well it is a Southern thing, not that I am Southerner, but I do live here and I guess I might as well allow some influence to creep into my recipes. When you move to another country, I strongly believe that you should try your best to become one with that country. By all means, be yourself, don’t change yourself, but open up for the country you moved to. Accept the norms and values of the new country, the country you selected to live in. Sorry I am way off base here, but sometimes I hear and read about people complaining and blaming as if there is no tomorrow. When you move to another country, you’ll know beforehand that you’ll need to learn another language, accept that systems work differently, that people are different. That is so great about moving abroad, widen your horizon, expand your experience, have a diverse look onto the world, experience that things are different, not necessarily better and not necessarily worse, just different. Don’t fight it, but be open and embrace it. If you want everything to stay the same as ‘home’, why did you make the move? Financial reasons? Be happy that the new country offered you an opportunity. Religious reasons? Be happy that the new country allowed you to practice your religion. Safety reasons? Be happy that the new country opened its arms and welcoming you. Etc. I am not talking about the US specifically. My husband and I lived in 4 different countries and we saw/see it everywhere. Foreigners, immigrants, new citizens asking the country to change for them, rather than they accept the country the moved to. Don’t think that I am an angel, for from that, I have complaints and wishes for things to change, but at the same time I am love living in my new country (for 10 years now) and wish I made the move years and years ago. Back to this Grilled Butterflied Chicken with Rosemary. Butterfly the chicken, meaning cut the chicken in half lengthwise, along the backbone. Don’t cut through to the other side, and cut the backbone out. Rinse the chicken with cold water and pat dry. 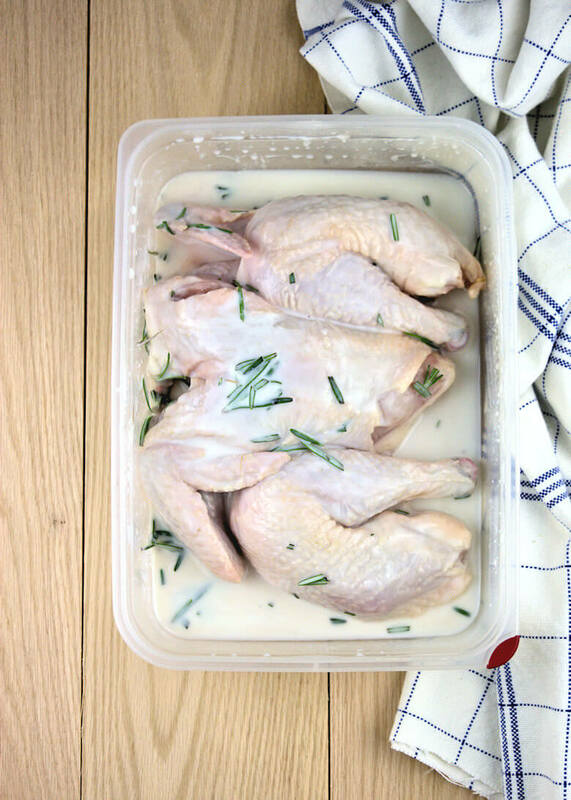 Prepare a mixture of buttermilk, salt, pepper and rosemary and place the chicken in this milky bath. It does not need to submerge, you can turn the chicken every now and then. Cover and marinate in the refrigerator overnight. Now it is time to preheat the grill. Once the grill is at medium high heat, turn one burner off. Place chicken on the rack, skin down. Position chicken over the burner that is off. Place a dripping pan filled with water on the rack as well. To avoid sticking you might want to coat the rack with cooking spray. Whether you need to do this, greatly depends on how clean your grill rack is and how often you want to check on the chicken. Let me forewarn you that the chicken is dripping, so you also need a dripping pan under the chicken as well. The first time I made this recipe, I had the entire grill engulfed in flames. Luckily, I saw it early enough to prevent a major disaster, but I needed water to extinguish the fire and by doing that soaked the chicken and the grill. So that night we did not have this Grilled Butterflied Chicken with Rosemary. This was a couple of years ago, when my mother stayed with us for 2 weeks and I wanted to show her how well I can grill. Not so well, must have been her conclusion. Grill chicken for approx. 1-1.5 hours or until heat thermometer indicates 180 degrees F. Turn chicken half way during grilling time. Keep the chicken warm until it is time to serve and then just cut the bird in pieces. Serving legs, wings, breast separately, or slice the chicken meat off the bones before you serve it. Don’t mind the mess in the kitchen; I love eating the meat off the bones. If you like more flavor, add garlic, sugar or other spices to the brine. Also use whole, full fat buttermilk; this add a little fat layer on the outside of the chicken, prevents it from drying out. 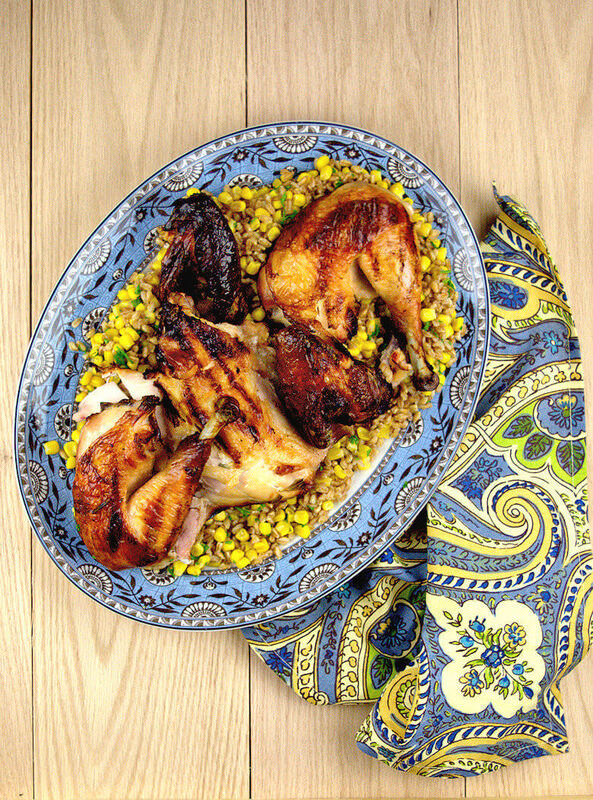 I served the Grilled Butterflied Chicken with Rosemary on a bed of farro with corn kernels. Crispy and moist. Simple and flavorful. Long soak, slow grill. 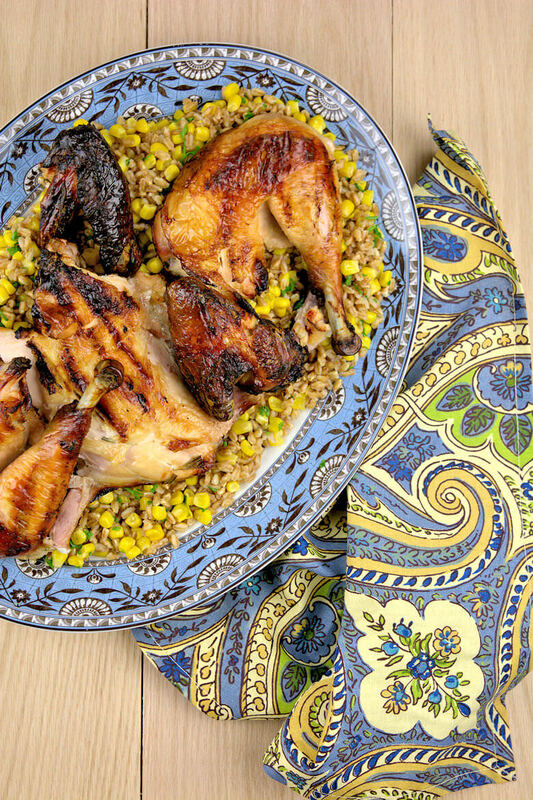 This Grilled Butterflied Chicken with Rosemary is a very satisfying dish that can be combined with potatoes, rice, pasta, or any other carbohydrate source in combination with a fresh salad or a warm vegetable. Butterfly the chicken. Cut the chicken in half lengthwise, along the backbone. Don't cut through to the other side, and take the backbone out. Rinse the chicken with cold water and pat dry. Prepare a mixture of buttermilk, salt, pepper and rosemary (add minced garlic if you like) and place the chicken in this milky bath. It does not need to submerge, you can turn the chicken every now and then. Cover and marinate in the refrigerator overnight. Preheat the grill. Once the grill is at medium high heat, turn one burner off. Place chicken on the rack, skin down. Position chicken over the burner that is off. To avoid sticking you might want to coat the rack with cooking spray. Place a dripping pan filled with water on the rack as well. Grill chicken for approx. 1-1.5 hours or until heat thermometer indicates 180 degrees F. Turn chicken half way during grilling time. Cut chicken in pieces before serving.